Welcome to Hotique's selection of Boutique Hotels in Santorini - including design hotels, resorts, rural hotels, and luxury hotels in Santorini . 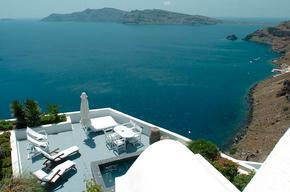 Pick your perfect hotel from our hand-picked selection of the best luxury hotels in Santorini . Santorini is full of stylish luxury hotels & hip hotels with stunning views that are individually styled and full of character. From the inland Vedema Resort, the romantic Caldera views of Ikies, the character of Tsitouras Collection and the stunning infinity pool of Perivolas, choose your very own Santorini boutique hotel that suits your style. Perched on the cliffs, high above the Aegean sea is a romantic hideaway with its own private "Garden of Eden" - colourful vegetation contrasts with the dark volcanic rock and white of the buildings. Located just a short walk from Oia, the most charming village in Santorini, Perivolas has the most stunning infinity pool in Santorini. Rates from Euros 400. 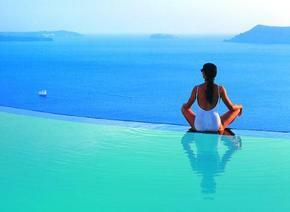 Vedema is a luxurious resort style hotel, located in the small village of Megalohori on Santorini. The individual "villas" are built round the 400 year old winery that dominates the heart of the property and there are one, two or three bedroom villas, all of which feature a lounge and small kitchenette, as well as the usual mod cons. Rates from Euros 495 in August. Located in Firastefani, The Tsitouras Collection is perched on cliff edge above the dark blue sea 1000 feet below. The views are simply breathtaking, with whitewashed stone and a sweeping picture postcard vista across the Caldera. Rates from 440 Euros. Pick the hip hotel that suits your style from Hotique's hand-picked selection.